It’s the end of December, so we all know what that means. It’s time to reflect on moments from this year and to make plans and goals for next year. But I’d rather not plan and goal-set; I’d rather just see what happens as it happens and be grateful for each moment as I live it. We started the new year celebrating with some of my oldest and greatest friends back in Boston, toasting to being together and to loving life. It was so wonderful to be able to share that with them, and to have shared Christmas with my whole family. Being an expat means you miss a lot of holidays and other celebrations, so the ones you’re there to attend become so much more meaningful. From Boston back to Roatan, January saw me wrapping up my role as the manager of Ocean Connections Water Sports, handing over the reigns after two years of building the business from a small dive shop into a major operation. And that meant that February was my first official month as a full-time freelance writer! That month was filled with appreciation and a touch of anxiety as I realized my newfound freedom came with the overwhelming task of building client relationships. But, having already gotten my foot in the door with several sporadic writing gigs last year, I started a snowball effect. By March, I’d started as the Roatan Correspondent for International Living, I’d built up a client list providing me with ample opportunities to increase my portfolio, and I was having a blast. Yep, he’s a tough biker dude! The next few months were spent in Roatan writing, diving, and loving life. April and May are my favorite months on the island. They offer the best weather and the smallest crowds; head to Roatan then if you want the ideal escape. In June I headed Stateside solo to celebrate with two friends at their weddings. Both were in Massachusetts, with the first being in downtown Boston and the second on Martha’s Vineyard. Between those two celebrations I road-tripped to Washington, DC, and Virginia to catch up with friends. I was able to spend several weeks visiting some of my favorite people, although realizing how much had happened in the two years since I’d last seen them all amazed me. New homes, new babies, new relationships, new jobs…it was so lovely to see everyone’s world changing and yet all of our lives still intertwined perfectly. My return to Roatan was brief as we packed and spent every possible moment soaking in the sunshine and laughter with our friends. At the end of August, we flew back to Boston together to stay with my family and friends. Our typical visits to the area were only a week or two, so an extended trip gave us more time to relax, rather than rushing about to see everyone and do everything. I also added a trip out to Las Vegas to speak at the International Living conference, where I met some of you! Since leaving Boston, we’ve been outside Edinburgh with my Irish-Colombian’s family and friends – with a quick trip to London to visit friends and family again. We were staying with his parents until recently, and we’ve now moved into our own apartment just outside the city. We’ve been busy exploring our new area, and I’ve been busy learning a whole new world (more to come on that soon!). Lina has grown more fur and adjusted to the colder weather; and we’ve all enjoyed being able to spend so much time with our family and friends. I spent time in five U.S. states plus the District. I enjoyed a total of eleven weeks with my family and friends around Boston. I witnessed three beautiful weddings in three different locations in the U.S.
We enjoyed nine weeks with my Irish-Colombian’s parents in Scotland, including our first Christmas all together. I visited my family and friends in London again. We left Honduras and moved to Scotland. I launched a freelance writing career that allows me to do this kind of travel while still working. I presented at the International Living conference in Las Vegas. And now we’re celebrating the holidays in a new home, where Amazon delivers so you can build yourself a Christmas tree from the plentiful boxes! Of course, life has to have its downs so you can appreciate the ups even more. This year, we lost my Irish-Colombian’s Abuela, and we lost my own Grandpa as well. Goodbyes are always hard. But when a life has been lived so fully and those left behind feel honored to have shared the path together, I can’t help but feel joy knowing that those who are missed today were so very loved all their days on Earth. I strive to celebrate that love and that joy with the people around me every day. I hope you do, too. 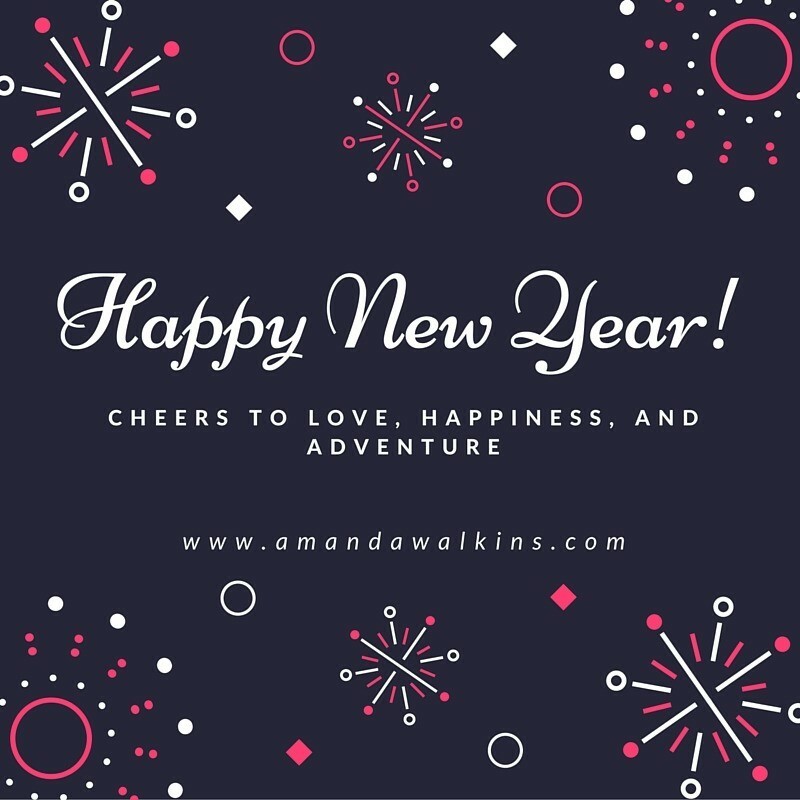 Cheers to love, happiness, and adventure – I hope your year was filled with as much as mine was. It’s the way Grandpa lived each of his 90 years, and his footsteps are ones I am more than proud to follow. If you want to find out what’s next for us, sign up for my weekly newsletter! Enter your name and email address into any of the subscription boxes.